Ask any homeowner about their experiences in decorating their guest bedrooms and they would be narrating a horrific story of how they have tried to pull the best that they could but ended up with something that they could not even dream about. This is so because guest bedrooms are tricky. Even the best interior designers have to spend more time and effort in designing these rooms. Your own bedroom can be designed according to your taste and personality. However, with guest bedrooms, you are not allowed such freedom. You have to make sure that the bedroom appeals to everyone and provides you the right look and feel. Let us have a look at a very cozy bedroom design idea that would definitely make it a hit. Start with the walls. Make them oyster grey or deeper and darker shades of whites. This is one color that can never go wrong in any room. Avoid off white at any cost. It makes the room look empty and doesn’t generally cast a very favorable impression on someone who has to live in it, even for a day. Darker or warmer shades of white are more appealing to everyone. Plus, it would go well with the rest of the theme. The theme of the room would be white and deep grey. Remember, you have to focus on grey furniture and white furnishings or vice versa. The bed would be coming in with a white textured headboard which would also be replicated on the inside plank of the wall units. The linen should be deep grey in color. 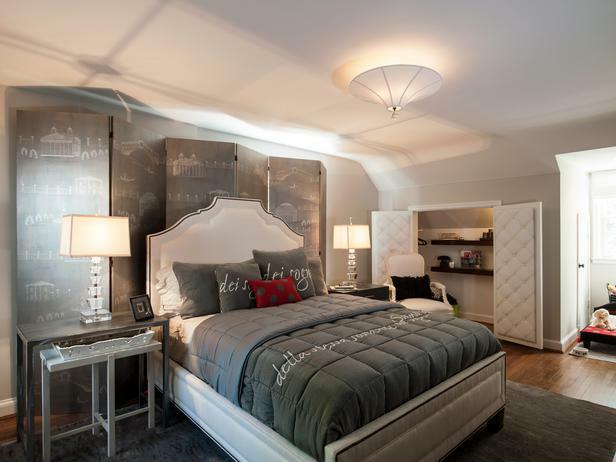 Use a screen behind the bed in order to provide a neutral but powerful personality to the room. If you don’t wish to use this screen, you can even opt for a painting or a huge photograph at this place. Opt for a small industrial style side table that is made of metal and painted in deep grey. Add smaller white details or add a white flower pot or contemporary lamp here. The cushions and pillows that you would be using here should also be deep grey in color. Keep the wall unit small, short and very very simple. You can even add a pet bed at the side of the room so that the guest, who comes with a pet doesn’t have any issues when it comes to tending their pets. Moreover, the pets would not even leave scratches on the sheets. Use bright amber lights in the room. Though grey and white are usually neutral colors, we are using a warmer theme. Therefore, to accentuate the theme and make the environment warm, you would have to make sure that you are using amber lights. Always keep them as bright as possible as deep amber would ruin the look of this room. Just to break the monotony of the room, you can keep one small red pillow on the bed. If you are using a flower vase on the end table, decorate it with bright red flowers and get the right look.